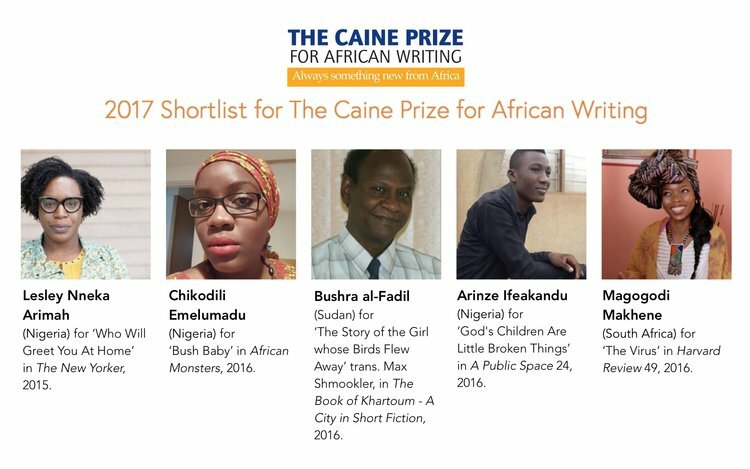 The five-writer shortlist for the 2017 Caine Prize for African Writing has been announced by Chair of judges, award winning author, poet and editor, Nii Ayikwei Parkes. The list includes a former Caine Prize shortistee and features a story translated form Arabic for the second time in the 18 year history of the Prize. The full panel of judges joining Nii Ayikwei Parkes includes the 2007 Caine Prize winner, Monica Arac de Nyeko; accomplished author and Chair of the English Department at Georgetown University, Professor Ricardo Ortiz; Libyan author and human rights campaigner, Ghazi Gheblawi; and distinguished African literary scholar, Dr Ranka Primorac, University of Southampton. The winner of the £10,000 prize will be announced at an award ceremony and dinner at Senate House Library, London, in partnership with SOAS, on Monday 3 July. Each shortlisted writer will also receive £500. Each of these stories will be published in New Internationalist’s 2017 Caine Prize anthology The Goddess of Mwtara and Other Stories in June and through co-publishers in 16 African countries, who receive a print-ready PDF free of charge.